So you want to pass a parcel tax. Here’s how. In California, local school communities willing to tax themselves to better support the basic operations of their schools have just one option: the parcel tax. Why does a parcel tax take a 2/3 vote? Can a majority vote pass a parcel tax? How can we raise more money for our school district? How common are parcel taxes? What rate should a parcel tax be? Proposition 13 prohibited school districts from raising property taxes based on the value of property (“ad valorem taxes”), except for General Obligation bonds for facilities. It also required districts to secure two-thirds voter approval to pass a parcel tax. Most parcel taxes assess a flat fee on each parcel of property, no matter its size or value. California is actually the only state that uses this particular form of property tax to fund schools — and for good reason. Parcel taxes are a regressive tax by definition: they put a larger burden on less expensive properties (and less wealthy property owners). The owner of a small single family home in a modest neighborhood pays the same tax as the corporate owner of a manufacturing plant or large apartment complex. Some districts have added provisions to their parcel tax measures that cause taxes to vary, but usually this is used to avoid taxing parcels owned by senior citizens who might otherwise vote no. About a tenth of students in California attend a school supported by a parcel tax. Relatively few districts have attempted to pass a parcel tax because it must pass by a 2/3 vote, which is difficult to achieve. More than half of the parcel tax elections held since 1983 have passed, but the districts that passed them represent less than 10% of the student population of California. Most are in the San Francisco Bay Area. A proposal that has surfaced repeatedly would reduce the passage threshold for parcel taxes to 55%. Why 55%? Because it has a precedent. Voters approved a 55% “super-majority” provision for facility bonds in 2001. (See Lesson 5.9.) If the passage rate for local parcel taxes for schools were lowered, many more communities would pass them, as discussed in this short video from the Public Policy Institute of California. Passing a local tax measure is hard. To succeed, local campaigns in support of schools must engage whole communities in public education issues, challenges, and opportunities. It's door-to-door, handshake-to-handshake work. If you are thinking about it, start with a visit to the registrar of voters in your county to understand the process. 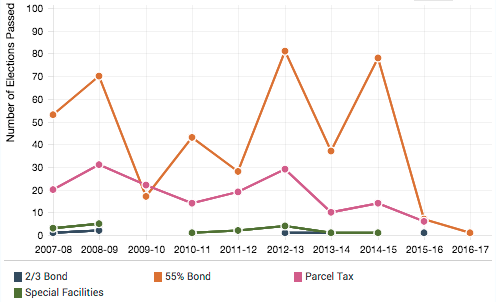 Learn much more about parcel taxes and bonds in our blog. The next lesson delves into one more way communities support their schools — as volunteers. Volunteer resources are noteworthy, but seldom accounted for in a meaningful way. Parcel tax measures can support local schools, but they are difficult to pass, because they require a two-thirds supermajority vote. About what portion of California's students attend a school that is supported by a local parcel tax? I had not realized how infrequently parcel taxes were passed, nor that most of those were concentrated in the SF area. Our school district has managed to get some passed, and from those campaigns I know how strategic an effort it has to be both in terms of to whom you direct efforts, and what message/s you need.